So you have read my posting on how to pick a Simmons Beautyrest NxG Mattress and you have decided that you wanted to go with the Simmons Beautyrest NxG 250, but you are looking for reviews to re-assure yourself that this is a sound decision for your hard earned money. Let me start my Simmons Beautyrest NxG 250 Review by saying that you need to listen to your body when you lay on the bed. If your body tells you that this mattress is "a slice of heaven" that you want to sleep on for the next 10-20 years, then quite frankly you need to go with the bed. The one thing I always caution my clients on, is the urge you have to read too many "reviews" on the bed you like, and I will tell you why. The reason that mattress reviews can be misleading is because EVERYONE has different requirements for sleep, so everyone will have a different opinion on the matter. It is one thing that is just fine to take a review at face value and that is talking about pricing and construction, and that is where we shall begin. Now being that I am a self-proclaimed "mattress nerd" I love to know all the specs on a bed, but does it really make a difference with the feel of the bed because there is tempered steel in the coils? In this case it does. The tempered steel in the pre-loaded pocketed coils that make up the Simmons Beautyrest NxG 250 give the mattress unmatched pressure relief and postural alignment. That is all you need to know about the coil count in this bed, because any more will just confuse you and is quite frankly a waste of time even discussing. The ticking on the Simmons Beautyrest NxG Series beds feels great. Simmons did a good job matching up a light and fluffy feeling material that doesn't detract from the feeling of the bed. One other note about the ticking is that you will notice that there seems to be some slack on the top of the bed because you can use your fingers and pull it up an inch or so, and this is a good thing. See the non-mattress nerd dose not understand the value in that. See when you lay down on the Simmons NxG 250 the slack allows you to float into your own personal pressure relief, and not have the feeling of laying on the top of a drum head (Sorry Sealy). There are not too many beds that give you such slack and it makes a world of difference. I bet your "mattress guy" didn't explain that little tid bit too ya did he? Now this is the good stuff here. This is where you get all of your pressure relief from in the bed. 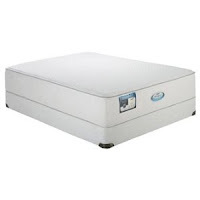 In the Simmons Beautyrest NxG 250 there is 2 1/2" of NxG memory foam. This is not your ordinary memory foam, and in my humble opinion is the best memory foam out there (Sorry Tempurpedic). What makes NxG foam so great in this bed is that it instantly conforms to every nook and cranny of your body, but doesn't feel like the bed is swallowing you. Now I know it is going to pain most people to spend $2,000+ on a queen size bed, but think of it as an investment in your health. This bed is worth every single penny you will spend on it. It has everything you need to keep your body in perfect posture alignment and provides superior pressure relief. Once you get this Simmons Beautyrest NxG 250 at home and sleep on it for a few weeks you will NEVER want to sleep on anything else again. The bummer about these beds is that they are IMAP priced. In plain English that means that the minimum price is set by the manufacturer so they don't get any cheaper then what you will find them for online. Well the verdict is that this is one heck of a sleep system. It delivers posture alignment and pressure relief so that you wake up more refreshed and there is a good chance many of your aches and pains will go away because they are related to your current bed. Now you may want to know where to buy the Simmons Beautyrest NxG 250 plush or firm, and let me tell you just buy it online. If you are reading this you most likely laid on one already and can understand everything I have said in this review. If you like the bed I strongly suggest buying it online and I have provided links below so you can check the latest BOTTOM LINE prices, and if you feel so inclined I suggest you purchase it from there, because their customer service is outstanding and I believe they are also offering free shipping and some other goodies right now without dealing what that annoying salesperson. You owe this to yourself, so start sleeping better and improve your quality of life today. Because of the competitive nature of the bedding industry click the picture of the Simmons NxG 250 beds below to see the current bottom line, no nonsense prices. Thank you for your review, I purchased the bed yesterday, and then got severe buyer's remorse because of the price, now I feel confident in my decision!! Thank you!!! Great review! I layed on this bed in the show room and like this better than all foam mattress beds. And Ive tested out soo many. This mattress just feels well put together-heavy duty-but so soft it's too good to be true. BUT IT IS...I purchased this today.